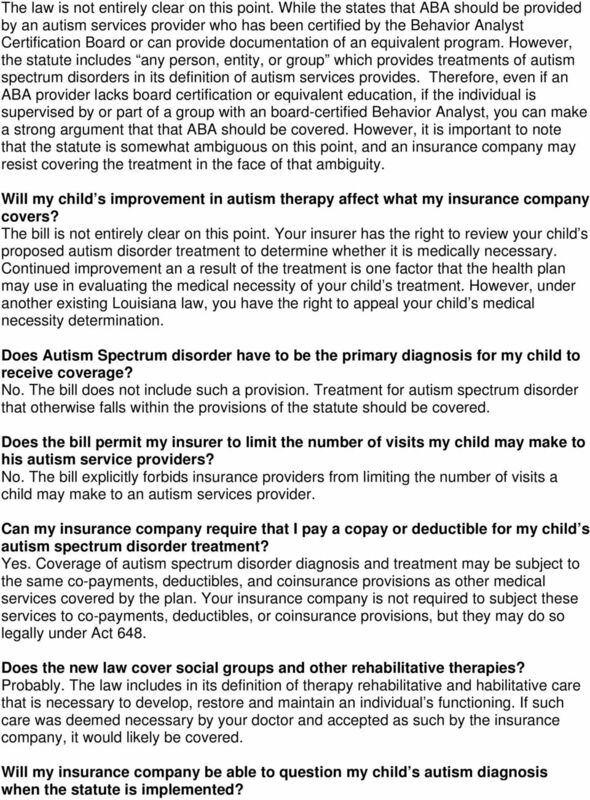 Download "LOUISIANA: Frequently Asked Questions About the Autism Insurance Reform Law"
2 per year and $144,000 of services over your child s lifetime. The caps do not apply to any benefits unrelated to your child s autism spectrum disorder that are covered under the plan health plan. Covered Services What diagnostic tests for Autism will be covered? The bill states that medically necessary assessment, evaluations or tests to determine whether an individual has one of the autism spectrum disorders are covered. Presumably, whether a treatment is medically necessary is determined by a physician. Does Autism have to be primary diagnosis? No. Statute does not specifically provide that. What services are included under the bill? The law requires that affected insurance companies cover treatment for autism spectrum disorders. It defines treatment for autism spectrum disorders as (1) habilitative or rehabilitative care, such as processional, counseling, and guidance services and treatment, including applied behavior analysis ( ABA ); (2) pharmacy care, defined as medications prescribed by a licensed physician; (3) psychiatric care, defined as direct or consultative services provided by a state-licensed psychiatrist; (4) psychological care, defined as direct or consultative services provided by a statelicensed psychologist; and (5) therapeutic care, defined as services provided by licensed or certified speech therapists, occupational therapists, pr physical therapists. How are these covered services limited? Act 648 does not include a list of specified treatments, but rather groups treatments into the five categories listed above. Will my insurance cover ABA under Act 648? Yes. The bill specifically indicates that ABA will be covered as a form of habilitative or rehabilitative care under the law. The law defines ABA treatment as the design, implementation, and evaluation or environmental modifications, using behavior stimuli and consequences, to provide socially significant improvement in human behavior, or including the use of direct observation, measurement, and functional analysis of the relationships between environment and behavior. 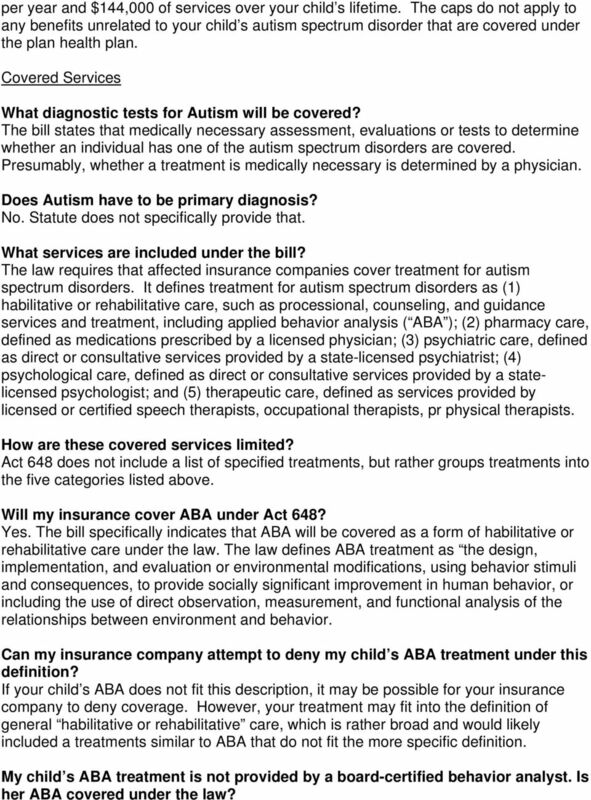 Can my insurance company attempt to deny my child s ABA treatment under this definition? If your child s ABA does not fit this description, it may be possible for your insurance company to deny coverage. However, your treatment may fit into the definition of general habilitative or rehabilitative care, which is rather broad and would likely included a treatments similar to ABA that do not fit the more specific definition. My child s ABA treatment is not provided by a board-certified behavior analyst. Is her ABA covered under the law? 3 The law is not entirely clear on this point. While the states that ABA should be provided by an autism services provider who has been certified by the Behavior Analyst Certification Board or can provide documentation of an equivalent program. However, the statute includes any person, entity, or group which provides treatments of autism spectrum disorders in its definition of autism services provides. Therefore, even if an ABA provider lacks board certification or equivalent education, if the individual is supervised by or part of a group with an board-certified Behavior Analyst, you can make a strong argument that that ABA should be covered. However, it is important to note that the statute is somewhat ambiguous on this point, and an insurance company may resist covering the treatment in the face of that ambiguity. Will my child s improvement in autism therapy affect what my insurance company covers? The bill is not entirely clear on this point. Your insurer has the right to review your child s proposed autism disorder treatment to determine whether it is medically necessary. Continued improvement an a result of the treatment is one factor that the health plan may use in evaluating the medical necessity of your child s treatment. However, under another existing Louisiana law, you have the right to appeal your child s medical necessity determination. Does Autism Spectrum disorder have to be the primary diagnosis for my child to receive coverage? No. The bill does not include such a provision. Treatment for autism spectrum disorder that otherwise falls within the provisions of the statute should be covered. Does the bill permit my insurer to limit the number of visits my child may make to his autism service providers? No. The bill explicitly forbids insurance providers from limiting the number of visits a child may make to an autism services provider. Can my insurance company require that I pay a copay or deductible for my child s autism spectrum disorder treatment? Yes. Coverage of autism spectrum disorder diagnosis and treatment may be subject to the same co-payments, deductibles, and coinsurance provisions as other medical services covered by the plan. Your insurance company is not required to subject these services to co-payments, deductibles, or coinsurance provisions, but they may do so legally under Act 648. Does the new law cover social groups and other rehabilitative therapies? Probably. The law includes in its definition of therapy rehabilitative and habilitative care that is necessary to develop, restore and maintain an individual s functioning. If such care was deemed necessary by your doctor and accepted as such by the insurance company, it would likely be covered. 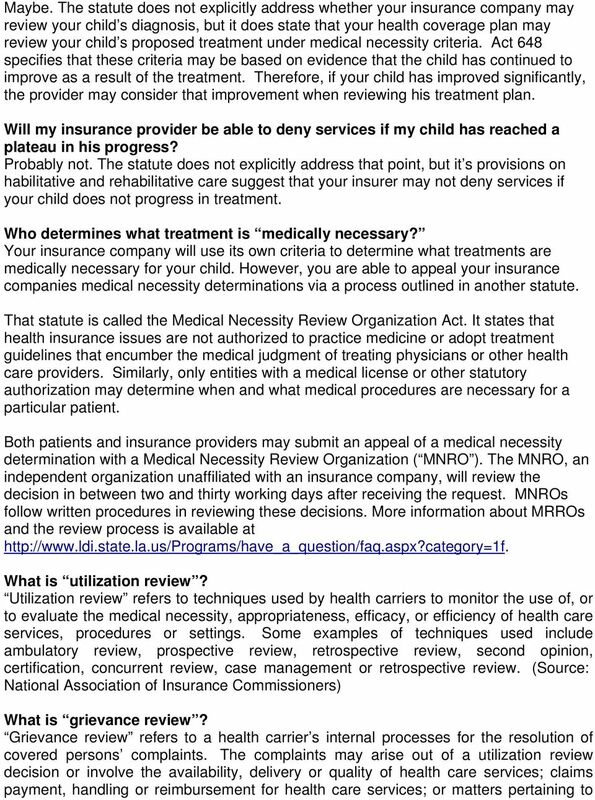 Will my insurance company be able to question my child s autism diagnosis when the statute is implemented? 5 the contractual relationship between a covered person or health carrier. Some states may call it an internal appeal process. 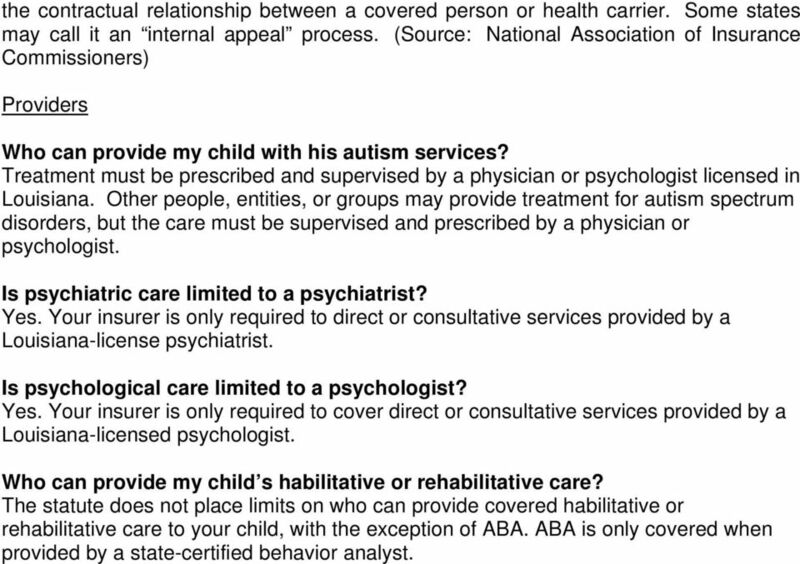 (Source: National Association of Insurance Commissioners) Providers Who can provide my child with his autism services? Treatment must be prescribed and supervised by a physician or psychologist licensed in Louisiana. Other people, entities, or groups may provide treatment for autism spectrum disorders, but the care must be supervised and prescribed by a physician or psychologist. Is psychiatric care limited to a psychiatrist? Yes. Your insurer is only required to direct or consultative services provided by a Louisiana-license psychiatrist. Is psychological care limited to a psychologist? Yes. Your insurer is only required to cover direct or consultative services provided by a Louisiana-licensed psychologist. Who can provide my child s habilitative or rehabilitative care? The statute does not place limits on who can provide covered habilitative or rehabilitative care to your child, with the exception of ABA. ABA is only covered when provided by a state-certified behavior analyst. 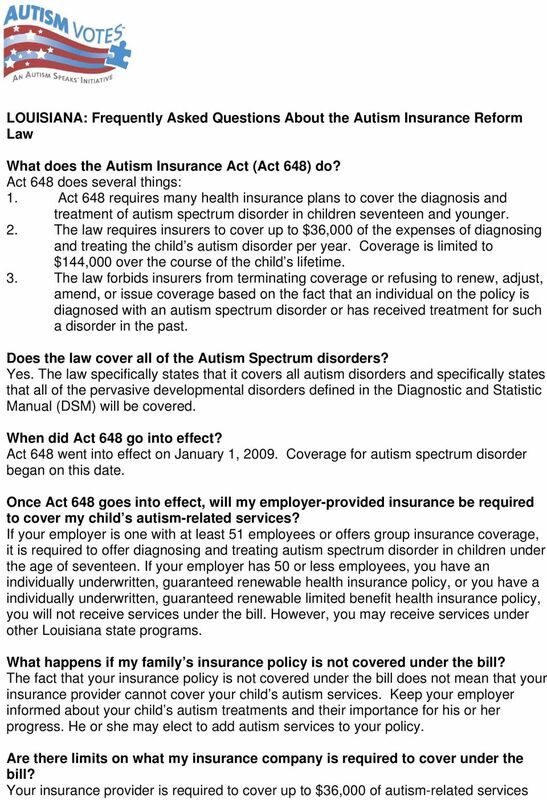 INDIANA: Frequently Asked Questions About the Autism Insurance Reform Law. What does Indiana s Autism Spectrum Disorder Insurance Mandate do? CALIFORNIA. 2. When does the law requiring insurance companies to cover services for children with autism spectrum disorder go into effect? What does SB 946 (which requires private health plans to provide some services for people with autism) mean for me? What is Autism? Autism. Maryland Autism Technical Advisory Group. Autism is a medical condition, brought on through no fault of the family. Self-Funded Health Plans: Establishing an Autism Benefit Lorri Unumb, Esq. Autism Speaks lorri.unumb@autismspeaks.org What is Autism? Autism is a medical condition, brought on through no fault of the family. In the matter of STATE OF MICHIGAN DEPARTMENT OF LABOR & ECONOMIC GROWTH OFFICE OF FINANCIAL AND INSURANCE SERVICES Before the Commissioner of Financial and Insurance Services XXXXX Petitioner File No. AMENDMENT #4 American Maritime Officers Medical Plan Employer Identification Number: 13-5600786 Plan Number: 501 Group Number: 0081717 This Amendment is duly adopted and effective as of October 1, 2014.